On a warm spring evening in Beirut, I’m sipping a champagne cocktail with Kamal Mouzawak at La Magnanerie, a gorgeous event space with an old stone façade repurposed from a 19th century silk factory, and courtyard, located in the suburbs of the city. Cooks from Mouzawak’s Beirut restaurant Tawlet, part of the larger Souk el Tayeb organization that seeks to reopen the channels between those who produce food and those who buy it, are preparing traditional Lebanese dishes — food typically consumed in the home — as part of the Common Fest, a four day cultural exchange between Berlin and Beirut. Looking around now, it’s hard to imagine that this was once a place of worm carnage. Cool lamp installations light exhibited drawings and photographs by Lebanese and German artists, as young hipsters mingle with an elegantly dressed older crowd, here to enjoy the fruits of the Tawlet cooks’ labor. A German menu comprising traditional Berlin dishes has also been prepared by the staff of Berlin’s Sage restaurant. At its helm is Jake Schöder, a tall East Berliner with a long blonde ponytail and a vice like handshake that necessitates another cocktail. Mouzawak comes from a farming background, so working to support them comes naturally to him. “My parents were farmers, my grandparents and uncle farmed citrus, green vegetables and herbs in Jeita,” he says. 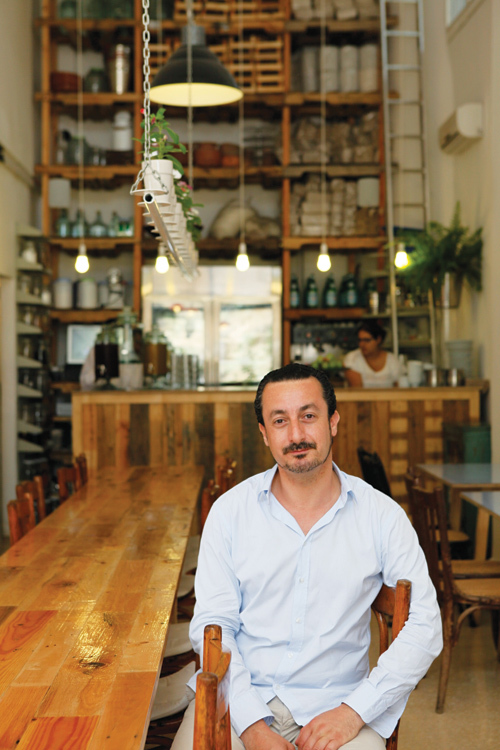 “I was always passionate about social change, always thinking about how we can make things better.” Souk el Tayeb started as an institution in 2004, when a local garden show asked Mouzawak to handle the food section of the event. From there, the farmer’s market developed into a regional food festival, which then developed into Tawlet. 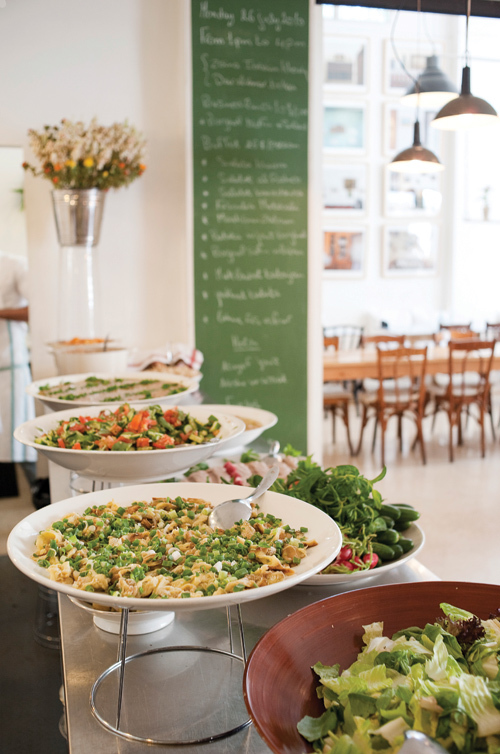 At each of Tawlet’s “farmer’s kitchens,” cooks from all over Lebanon prepare local dishes from their own private repertoires, often handed down from generation to generation. 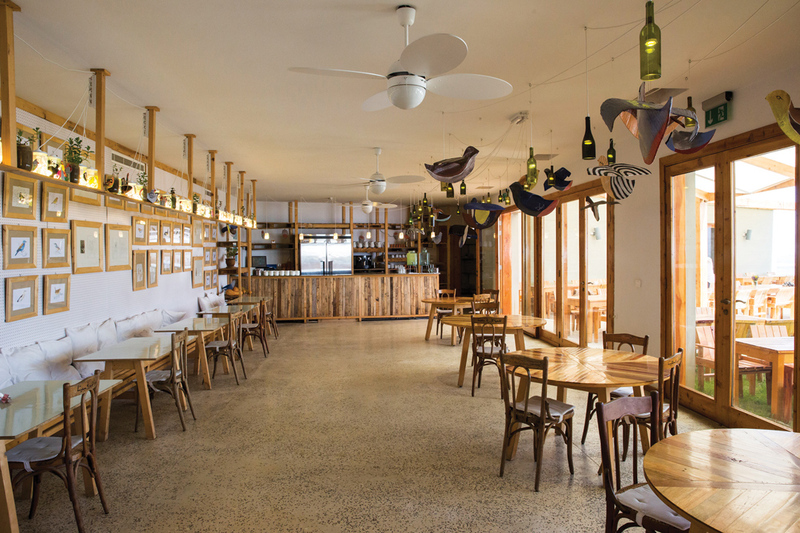 The menu changes almost daily, but always features unique dishes that you won’t find at your run-of-the-mill Lebanese restaurant. The meal at Common Fest featured, for instance, loubiyeh w koussa — green beans and zucchini — “a signature dish from one of our cooks in the west Bekaa,” says Mouzawak, and kibbeh bi zeit, “the weirdest kibbeh,” he says, laughing, in reference to the dish of ground beef and bulgur wheat cooked in oil. The dessert, a kind of biscuit called kharabeesh, “is from the best guy in the universe, in Wadi Shahrour [south of Beirut], he makes the thinnest dough and inside is pistachio paste,” flavored with rosewater — Mouzawak is prone to waxing lyrical about Tawlet’s dishes. Full as one can only be after a buffet meal, on my way out, I stop for a final chat with Schöder, who’s celebrating with his cooks their final dinner service in Beirut. The conversation turns to his restaurant in Berlin, which he tells me also used to be a silk factory. Workers there would receive the cocoons, unravel and treat them, and weave the threads into silk fabric. Cocoons from Lebanese worms processed here, at La Magnanerie, ending up at what is now his restaurant in Berlin would be too delicious a coincidence for me to even consider at this point. It’s satisfying enough to be reminded that Common Fest is just the latest avenue in a network of exchange that has existed for centuries.